The above two photographs are of the same part of the sky. 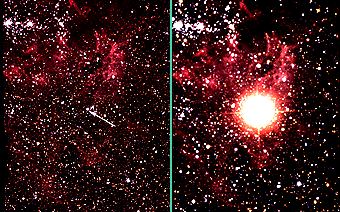 The photo on the right was taken in 1987 during the supernova explosion of SN 1987A, while the left hand photo was taken beforehand. Supernovae are one of the most energetic explosions in nature, equivalent to the power in a 1028megaton bomb (i.e., a few octillion nuclear warheads). Type Ia. These result from some binary star systems in which a carbon-oxygen white dwarf is accreting matter from a companion. 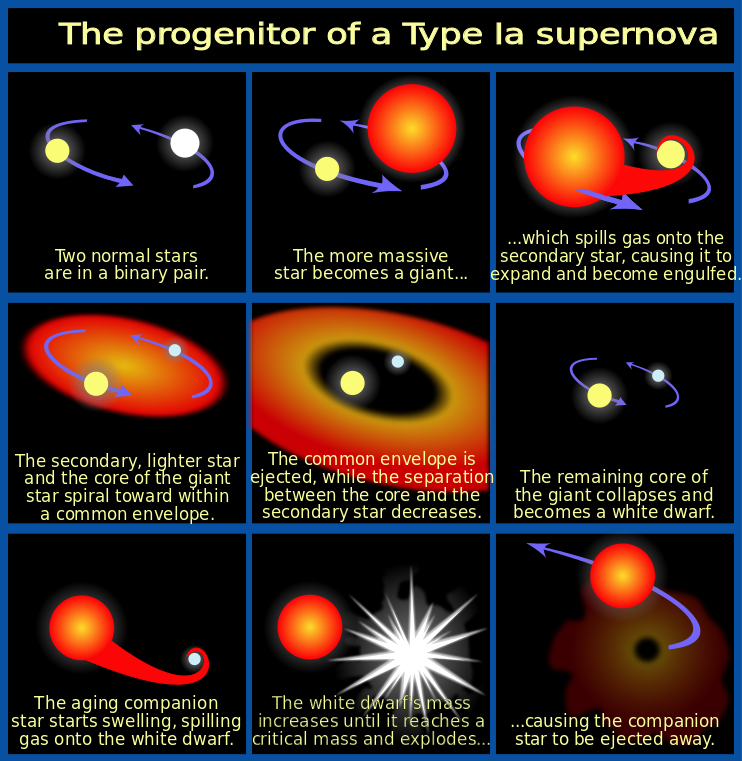 (What kind of companion star is best suited to produce Type Ia supernovae is hotly debated.) In a popular scenario, so much mass piles up on the white dwarf that its core reaches a critical density of 2 x 109 g/cm3. This is enough to result in an uncontrolled fusion of carbon and oxygen, thus detonating the star. Type II. These supernovae occur at the end of a massive star’s lifetime, when its nuclear fuel is exhausted and it is no longer supported by the release of nuclear energy. If the star’s iron core is massive enough, it will collapse and become a supernova. However, these types of supernovae were originally classified based on the existence of hydrogen spectral lines: Type Ia spectra do not show hydrogen lines, while Type II spectra do. In general this observational classification agrees with the physical classification outlined above, because massive stars have atmospheres that are made of mostly hydrogen, while white dwarf stars are bare. However, if the original star was so massive that its strong stellar wind had already blown off the hydrogen from its atmosphere by the time of the explosion, then it too will not show hydrogen spectral lines. These supernovae are often called Type Ib supernovae, despite really being part of the Type II class of supernovae. Looking at this discrepancy between our modern classification, which is based on a true difference in how supernovae explode, and the historical classification, which is based on early observations, one can see how classifications in science can change over time as we better understand the natural world. Gravity gives the supernova its energy. For Type II supernovae, mass flows into the core by the continued formation of iron from nuclear fusion. Once the core has gained so much mass that it cannot withstand its own weight, the core implodes. This implosion can usually be brought to a halt by neutrons, the only things in nature that can stop such a gravitational collapse. Even neutrons sometimes fail depending on the mass of the star’s core. When the collapse is abruptly stopped by the neutrons, matter bounces off the hard iron core, thus turning the implosion into an explosion. For a Type Ia supernova, the energy comes from the runaway fusion of carbon and oxygen in the core of a white dwarf. Where does the core go? When the core is less massive than about 5 solar masses, the neutrons are successful in halting the collapse of the star creating a neutron star. Neutron stars can sometimes be observed as pulsars or X-ray binaries. When the core is more massive (Mcore > ~ 5 solar masses), nothing in the known universe is able to stop the core collapse, so the core completely falls into itself, creating a black hole, an object so dense that even light cannot escape its gravitational grasp. This result is called the escape velocity. For the Earth, the escape velocity is 11 km/sec. 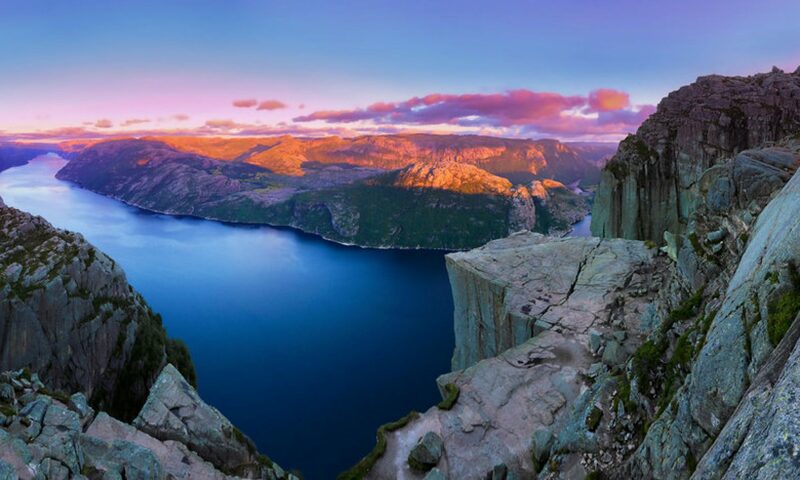 Next imagine a star’s central core in the role of the Earth in the above analogy. Consider what would happen if during the core collapse, the central core became so dense (i.e., the radius became very small while its mass stays the same) that something would have to travel faster than light to escape. Whenever this phenomenon occurs (i.e., Mcore > ~ 5 solar masses), the supernova creates a black hole from the core of the original star. Now the escape velocity is greater than the speed of light, which is 300,000 km/sec. Where does most of the star go? The core is only the very small center of an extremely large star that for many millions of years had been making many (but not all) of the elements that we find here on Earth. When a star’s core collapses, an enormous blast wave is created with the energy of about 1028 mega-tons. This blast wave plows the star’s atmosphere into interstellar space, propelling the elements created in the explosion outward as the star becomes a supernova remnant. Many of the more common elements were made through nuclear fusion in the cores of stars, but many of the rarer elements were not. Because nuclear fusion reactions that make elements heavier than iron require more energy than they give off, such reactions do not occur under stable conditions in typical stars. On the other hand, supernovae are not stable, so they can make these heavy elements beyond iron. In addition to making elements, supernovae scatter the elements that are made by both the star and supernova out into the interstellar medium. These are the elements that make up stars, planets and everything on Earth, including our bodies. Although many supernovae have been seen in nearby galaxies, supernova explosions are relatively rare events in our own galaxy, happening once a century or so on average. The last nearby supernova explosion occurred in 1680, It was thought to be just a normal star at the time, but it caused a discrepancy in the observer’s star catalogue, which historians finally resolved 300 years later, after the supernova remnant (Cassiopeia A) was discovered and its age estimated. 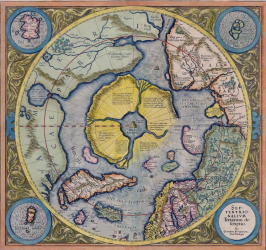 Before 1680, the two most recent supernova explosions were observed by the great astronomers Tycho Brahe and Johannes Kepler in 1572 and 1604 respectively. In 1987, there was a supernova explosion in the Large Magellanic Cloud, a companion galaxy to the Milky Way. 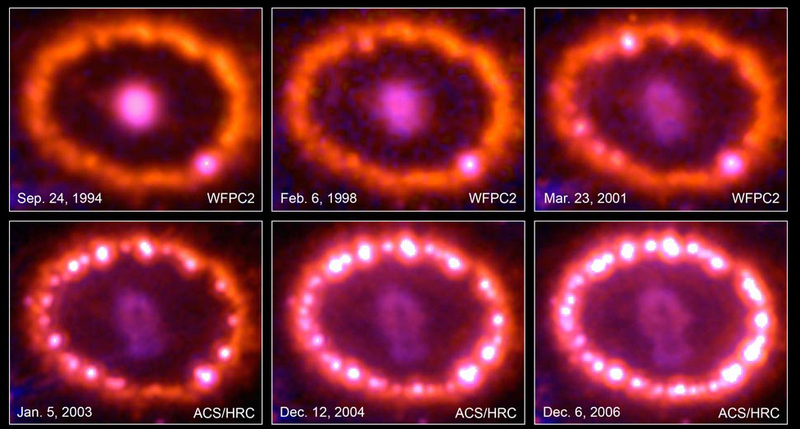 Supernova 1987A, which is shown at the top of the page, is close enough to continuously observe as it changes over time, thus greatly expanding astronomers’ understanding of this fascinating phenomenon. 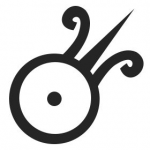 This article got me of guard for a moment, than I started to analyse. – A specific example and nothing seems wrong, looks and is presented as real science but the DATA any specifics) is lacking completely, meaning no interpretation for yourself, gotta believe the article……. Now this decay rate of Mn54 decaying to Cr54 is by no means the same as decay for Uranium for example!!!! Uranium decay (and other heavy radioactive isotopes) release electron, neutrons, and whole helium atoms in their decay steps. not catching an electron…. The point is this would be the WORST example one can take to perform this study and is not the same at all for normal decay (isotopes). Meaning all these processes are nuclear processes but very different. In my book, this is a deliberate attempt to get rid of this notion that indeed the decay rate may be dictated by external factors. Any good example of a study that confirms this would be appreciated. As far as neutron stars and black holes, they can NOT exist, which means pulsars and magnetars also do not exist. This I am sure about. The fundamental mistake that got us there, is still being taught in the first year of college physics, and first semester of astronomy. The mainstream obviously ignored electricity and charge segregation on large scales. I do want to make sure we don’t make the opposite mistake, and ignore gravity, especially on the small scale. If it is true that objects in a nucleus can be shielded from each other electrically, then we don’t need a “strong force” holding them together. If they “don’t see each other” because of those insulating double layers, then even a weak force like gravity can work on that scale too. It would only be with a breakdown of those charged double layers, that the electrical repulsion would dominate. That would be our radioactive decay. What if the loss (or gain) of total charge in a system ((due to discharge between bodies) has a correlation to the stability of (radioactive) elements? This is what I suspect. We know that there is a seeming correlation between radioactive decay rates of heavy elements on Earth, with seasonal variations in Earth-Sun distance. It means that decay rates, at the very least, are not intrinsic, but affected by the environment. type 1 sounds like fusion of elements such as C + O, however I am doubtful if this would yield enough energy even let alone how it would turn into a runaway reaction (not excluding either). Type 2 sounds more impossible to me as they propose. First of a black hole I hold impossible still. second thing is that I do not see how from Iron on there would be enough energy to create fusion because the reactions as more then likely endothermic from Iron on. Meaning I do not think the iron is even participating in the nova, except that it may trans-mutate into heavier elements due to the erroneous energy available using it in an endothermic reaction to create heavier element such as gold of uranium. A discharge on a large scale might do the trick, initiating a temporary (large) trigger for fusion processes, potentially being destructive for the body itself, it seems to me that the rarity of the event means that it is perhaps not so much of an intrinsic process? Fission (in type 2) could be happening, but that would require first a build-up of fissionable material that then would be triggered more or less like a nuke. Could the local circumstances be such that the stability of the elements suddenly changes? (speculation) What if the loss (or gain) of total charge in a system ((due to discharge between bodies) has a correlation to the stability of (radioactive) elements? A sudden change could mean that the threshold of stability would be lowered in an instance, triggering all the elements that now are above the threshold to go into fission. that would work for a nova. Notice that on the stellar scale, they believe they get this enormous release of energy (supernova), either by the combination of a low mass star with another, or from a single high mass star, which explodes, leaving a less massive core. This should remind you of how we get energy on the nuclear scale. We fuse low mass nuclei to get energy. We fission a single high mass nucleus to get energy, leaving a less massive nucleus behind. We also have the analogy of recurring nova (not nearly as energetic as a supernova), and the light given off by excited atoms. More on that later. I’ll suggest that if we take as a starting point, the idea that the two supernova types, are just larger scale versions of the two types of nuclear reactions, we may learn quite a bit.